The story of one young man's remarkable journey from corporate America to the Society of Jesus. James Martin leads you from his Catholic childhood through his success and ultimate dissatisfaction with the business world, to his novitiate and profession of vows as a Jesuit. 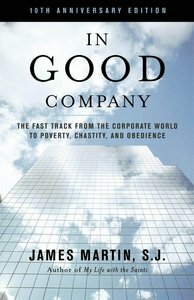 Fast-paced, compelling, and often humorous, his story offers a fresh, inside look at corporate America, the Jesuit vocation, and the human quest for a life well-lived. James Martin is an assocaite editor of America. A graduate of the Wharton School of the University of Pennsylvania, James Martin worked six years in corporate finance before entering the Society of Jesus in 1988. He was ordained a priestin June 1999. He is the author of In Good Company, This Our Exile and editor ofHow Can I Find God?